“Stop the environmental catastrophe in Lugovoya!” Photo courtesy of the author. All rights reserved.Moscow has no recycling system: all the city’s waste goes to landfill and the residents of its outlying areas are getting mightily fed up with the unsightly heaps and the stink they produce. The peak of the protests seemed to have passed in March, before Russia’s presidential election, but on 14 April, 4,000-8,000 people (figures vary according to the sources) turned out to protest in 10 towns around the capital. They called on the government to close down the overflowing landfill sites, abandon plans to build incinerator plants and introduce a recycling programme. Russia’s prosperous capital is the place to be for those looking to make money and an enhanced lifestyle. The city is constantly growing upwards and outwards, and high rise estates are shooting up in previously rural areas. The downside, however, are the landfill sites that surround them. Nobody seems to have thought that people would live so far from the city centre. But that’s what has happened, and now people who managed to move from the regions and get a job and a mortgage in Moscow are asking themselves: what was it all for? To admire the view of the rubbish heaps from their windows? But Muscovites seem to have decided to do things differently: to buy a cheap flat first and then sort things out. And it does need sorting out. Over the last 10 years, the volume of rubbish sent to landfill sites has increased by 30%. Official figures put it at 274.5m cubic metres, with 10% of that contributed by Moscow alone. Just under a half of the capital’s waste is domestic refuse: 22% of it is food, 17% paper and cardboard; three percent is textiles, metal and timber and the remaining 20% is mixed waste. In 2013, there were 12 landfill sites serving the Russian megapolis, and the Moscow region authorities planned to close them down and create facilities to sort and incinerate refuse. Andrey Vorobyev, the Moscow region’s governor, assured the public that the waste sites were closing down as planned. Now, in 2018, however the greater Moscow area’s detritus is providing work for 15 sites, a third of which have plans for expansion; three more are at the planning stage. The authorities claim that the landfill sites and heaps are safe, and that the stink is a temporary inconvenience, but people don’t believe them. They say that the rubbish isn’t sorted, so toxic waste (batteries, medicines and paints and varnishes) end up in landfill. Rotting food waste also produces liquid effluent that leaches into the soil and contaminates ground, water and nearby ponds and rivers. According to the N+1 popular scientific portal, Russia’s landfill sites release 1.5m tonnes of methane and 21.5m tonnes of CO2 into the atmosphere each year. In 2015, Russia had 13,900 functioning landfill sites, 14 of them in the Moscow region. Just one site, the Kulakovo site, was responsible for 2,400 tonnes of methane, 39.4 tonnes of carbon dioxide, 1.8 tonnes of ammonia and 0.028 tonnes of hydrogen sulphide being released into the capital’s atmosphere. As noted by Marianna Kharlamova, the head of Environmental Monitoring and Prognostics at Moscow’s Peoples’ Friendship University of Russia, the most toxic of the main gases being released are hydrogen sulphide and methane. High concentrations of these gases can cause poisoning. The first signs of mass environmental protest began to emerge in 2010, when Muscovites stood up to the felling of Khimki forest northwest of the city. Protesters were mostly residents of Moscow’s outlying areas who preferred clean air to the amenities of the megapolis. But the rubbish issue changed their plans. Moscow is expanding: in 2017, the number of square metres built rose by an extra three percent compared to 2016, despite experts forecasting an economic downturn. Now the analysts are talking about a 20% increase in housing by 2020, and an annual population growth of one percent. And as the population grows, so does the number of rubbish dumps. Where did the protests come from? 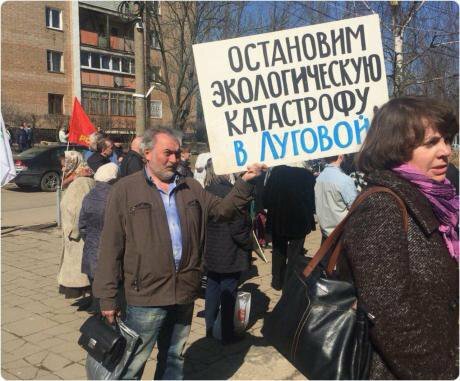 Public expressions of dissatisfaction began in March with protest meetings in Volokolamsk, a town 130 kilometres northwest of Moscow and twenty years older than the capital. Volokolamsk’s 20,000 residents have lower incomes and a lower standard of living than those in the big city, but the pleasant environment and clean air go some way in making up for their other disadvantages. The protests began on the eve of Russia’s presidential election. According to their organisers, these meetings had nothing to do with politics, but the proximity of a major political event brought the national press and one of the presidential candidates, Ksenia Sobchak, to town. Items about the landfill sites, proposed incineration plants and the waste sorting issue appeared on Russia’s main TV channels, as well as in prominent press outlets. Protesters in Lobnya. Photo courtesy of the author. All rights reserved.The biggest story, however, was the announcement about several dozen children in Volokolamsk being poisoned by an “unknown gas”. According to locals, as reported by the Meduza news platform, the children had been taken to hospital, suffering from signs of poisoning by landfill gas (LFG), and specifically the Yadrovo site. 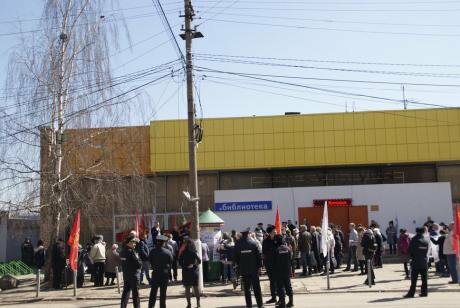 Governor Vorobyev paid a visit to the hospital and gave interviews to the national press and TV, but refused to meet local residents, which poisoned the atmosphere in the town even more. The protests continued. After his hospital visit, Vorobyev promised to initiate the “active reclamation” of the landfill site, but residents, furious at his high-handed behaviour, began to hold regular protest rallies and block the road to the site with a rubbish truck. The Kuchino landfill site, to the northeast of Moscow, had in fact been closed down before the Yadrovo incident: President Putin was forced to close it in June 2017 after a complaint during a live phone-in. The site was decommissioned and the rubbish from it transported to 15 other landfill sites in the Moscow region. As a result, the Yadrovo site had to be considerable enlarged, which made the environmental pollution of the area around it all the more obvious. The protests in Volokolamsk stirred up other parts of Moscow. Local residents have no desire for a repeat of the situation: if Yadrovo is closed down, the stuff will just be transported to other sites. 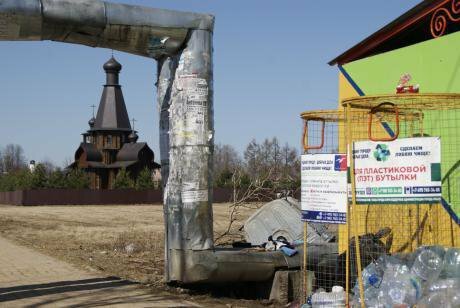 In late April, the anger spread to Yaroslavl, 264km northeast of Moscow and part of the “Golden Ring” of ancient Russian towns: Moscow’s rubbish, the residents believe, might end up being dumped in their backyard. At the time of writing this article, there have been protests against the opening of landfill sites and incineration plants in quite a number of towns in the Moscow region: Klin, Kolomna, Serpukhov, Chekhov, Lobnya, Krasnoarmeisk, Balashikha, Shatura, Dmitrov and Sergiev-Posad. The day designated for a raft of protests coincided with Governor Andrey Vorobyev’s birthday, so people taking part in the rallies came brought him presents, designed to persuade him to solve the rubbish problem. In Lobnya, northwest of Moscow, protesters greeted Vorobyev with appropriate comic songs in traditional folk style, while in Volokolamsk local activists gave him a cake made out of refuse. These “rubbish” protests have become an example of solidarity in the environmental movement. The Lobnya authorities permitted organisers to hold the rally not on the town’s main square, but its outskirts — the traditional resort of officials keen to reduce protester numbers and hence their impact. But the event’s effect was, on the contrary, heightened by the presence of protesters from other towns in the region: Chekhov, Stupino, Dolgoprudnoye, Dmitrov, Solnechnogorsk. Protest leaders came together from as far as 200-300km to someone else’s rally, to support the protest movement in general. After several unsuccessful attempts to organise a referendum in the Moscow area to oppose the construction of incineration plants and support separate waste collections, Trunin decided to “agree” to the authorities’ plans, but with a twist. He proposes the building of a supposedly safe incineration plant in Varkhivo, a village on the Rublyovka highway where most properties belong to Russia’s political and business elites. There is a lot of space and low rise building there, Trunin believes, so there will not be many people in the plant’s hinterland, and the security provided by the government presence will guarantee that no harm will come to it. “Why build in Solnechnogorsk, when you could build there?” he quips. Dmitry Trunin believes that separate waste collections will bring about a considerable reduction in the volume of refuse disposed of in landfill sites, as well as creating a recycling sector, while non-recyclable waste can still be incinerated at Moscow’s existing plants. The campaign for separate waste collections in Russia, which Trunin supports, has been in existence for a decade now. It is the most widespread informal public movement in the country, and is based on voluntary, grassroots initiatives. The largest “rubbish” organisations are “No.More.Waste”, which has activists in half of Russia’s regions, and “For Separate Collections”. And in 2014, Greenpeace Russia launched a petition campaign called “I Want Separate Collections”, which has so far collected 250,000 signatures — it is aiming at one million. Separate collections mean that refuse is divided into a minimum of two types — organic versus wet and dry refugee. Organic waste can be composted and used as fertiliser for farms and gardens. Dry waste is sorted: some can be recycled, and the rest incinerated or used for landfill. Greenpeace Russia estimates that the introduction of separate waste collections would reduce the amount of refuse ending up in landfill by 75-80%. Thanks to lengthy cooperation with the authorities in previous years and the current spate of protest rallies, a working party has been set up, charged with introducing separate waste collections in the Moscow area. Its members include independent local council members, local officials and civil activists. “I met Aleksandr Kogan, the Moscow region Minister for Natural Resources and the Environment, and he said that 93% of the local population support the idea of separate collections,” says Trunin. A rubbish dump in Lobnya. Photo courtesy of the author. All rights reserved.Yet in January this year, the Moscow area authorities published a draft document stating that the construction time for incinerator plants was to be shortened. Four new plants will be incinerating waste by 2023. Trunin thinks that this plan has been imposed on the region by central government, as half the waste to be incinerated will come from the capital. He also fears that this incinerator project will preempt any plan to introduce separate waste collections. It’s easier for the authorities to just burn all the waste. Burning and then transporting waste to landfill sites is in organisational terms similar to transporting and dumping it there in its original state. Officials often claim that protests are financed by foreign agents, while Russian TV has show freaks or urban crazies who are supposedly form the core of the protest. But, as with most protests in Russia, the “rubbish” actions attract perfectly sensible and capable citizens with long experience of opposing the authorities, whether national or local, when resolving their issues. And their activism and awareness raising activities allow others to express their own opinions at rallies. Municipal Council member Diana Yakovleva comes up against human rights infringements in her work as a lawyer, and helps clients fight for their legal rights in court or with the local authorities. “When I joined the council, people mostly came to me about environmental issues, because I’m involved in nature conservation activities,” Diana tells me. She has already succeeded in protecting three stretches of woodland from development as weekend “cottages” for rich Muscovites. Drawing on her own experience of activism, Diana advises rookie campaigners to set up an initiative group and prepare themselves for their work: publicise the issue in the press, go to receptions given by leaders at various levels of power, draw up petitions, send letters, attend protest rallies. Yakovleva points out that responsibility for urban planning matters, including waste reclamation, rarely rests with municipal authorities: all decisions are taken at regional or federal government level. She has also noticed an influx of lawyers from commercial firms, as well as local officials, beginning to give the public pro bono help with “rubbish” issues. Pyotr Lazarev, the mayor of Volokolamsk, the town where the most active protests began and are still continuing, is a real local hero. He was born in the town and has lived and worked there all his life. Since retiring in 2012, he has been a municipal councillor and in 2017 became mayor. Lazarev supports his town’s residents: he announced at the first protest rallies that he would coordinate local action on anti-landfill initiatives and demand that higher authorities resolve the waste problem. Lazarev has kept his word, and at a rally in Volokolamsk on 1 April said that, despite official threats, he would continue to give permission for protest actions. The regional authorities responded by carrying out a search at his flat. Igor Shestun, the head of Moscow area’s Serpukhov district, another area affected by “rubbish” protests, has also encountered harassment for trying to uphold the public’s rights. On 9 April, he posted a video message to President Putin on YouTube, detailing threats he has been receiving from a certain Mikhail Kuznetsov, who is demanding Shestun’s resignation on behalf of regional governor Andrey Vorobyev. Shestun sees this harassment as a reprisal for permitting protests against the Lesnoye landfill site, as well as his reluctance to resign from his post. He is currently absent from his home and has told the Novaya Gazeta newspaper that he is neither in hiding nor planning to emigrate. Artem Lyubimov, a lawyer who is heading the protests in Volokolamsk, is in a less happy situation. He was held under arrest for 15 days after the 31 March action, allegedly for offering resistance to police officers. The police also searched the premises of all his client companies, including the offices of the Moscow Raceway motor circuit. Veterans of the protest movement require separate mention. Journalist Aleksandr Gavrilin, a resident of Moscow’s Chekhov district, has been involved in civil society campaigning since 2004, when he was forced to stand up for his property rights. The successful outcome of this experience has indirectly led today to the demise of the Kulakovo landfill site, closed in August 2017 after two years of protests and eventually a hunger strike by local residents. “They tried to take us to court for holding rallies and pickets,” Gavrilin tells me. “I have been attacked 20 times in the course of my civil activism…The Kulikovo site has been closed down, but the problem hasn’t gone away: effluent from it is still leaching into the Sukhaya Lopasnya River. We want a proper land reclamation programme and waste sorting. I have had about a thousand letters a year from members of the public on the subject”. Gavrilin believes that the waste problem affects the whole of Greater Moscow, so moving a landfill site elsewhere will do nothing to solve the problem. And why, he asks, should he have to move from his home town, rather than standing up for his rights. There are problems with waste recycling in numerous parts of Russia: Bashkiria, the Komi Republic and the Vladivostok, Voronezh, Leningrad, Nizhny Novgorod, Novosibirsk, Samara, Tver, Chelyabinsk and Yaroslavl regions as well as Tatarstan, Sochi and the Stavropol Krai. But the most burning issue, as with the forest fires of 2010, is what do in the Moscow region. The authorities are trying, in the first place, to sort the problem out locally, in the areas close to the capital. Waste separation takes time, so Greater Moscow’s bureaucrats are engaged in urgent talks about rubbish being transported to the nearby Tver and Yaroslavl regions. The locals have protested there as well, but haven’t been able to offer the same powerful resistance. The Moscow government website states that waste will begin to be transported to a Yaroslavl landfill site in the course of this year, but whether Yaroslavl will tolerate the capital’s rubbish and the effect of the move on local taxes will soon become clear. The continuing protests, despite the government’s promise that landfill sites will be transformed and waste sorting introduced, show the level of distrust in the general public. People are calling for laboratories to run atmospheric tests, counting the number of cars going to dumps and trying to evaluate landfill reclamation projects. A high profile example of this is the “No Dump in Kolomna” Telegram channel. “They’re saying that we have agreed to allowing the dustcarts through,” one of the channel’s authors says. The bribery money settling on the sites stank so much that people have taken to the streets to remind the authorities of their responsibilities. They can’t just just sweep the dust under the carpet any more.